Download Rampage in Digital HD from the iTunes store. Rampage images are © New Line Cinema. All Rights Reserved. Besides making feature films out of popular novels and comic books, the newest trend is to fashion them after video games. The latest installment in that endeavor is a movie based on the 1986 arcade game called Rampage. In the game, players choose to be mutated humans who become giant creatures due to accidents in a science lab. These creatures attack and destroy whole cities while attempting to evade law enforcement. The movie, while still involving these massive beings, has a mildly different storyline that creates a whole backstory and a different set of villains in human form. George (Jason Liles; Death Note) is an albino monkey that was rescued from poachers by primatologist Davis Okoye (Dwayne Johnson; the Fast and Furious films) and who lives at the San Diego Zoo. He communicates through sign language and is generally known as a jokester in the primate enclosure. One night, however, he comes across a foreign object that fell from the sky and when he touches the box, it emits a gas that infects George making him grow at a rapid pace and become more aggressive. As Davis tries to figure out what is going on he learns there is a bigger, more sinister plot unfolding. The genetic mutation formula was being developed by a company run by the evil sibling team of Claire (Malin Akerman; 27 Dresses) and Brett (Jake Lacy; Carol) Wyden… well, she is evil, he is just dim-witted. Anyway, they were using this formula as a biogenetic weapon and it seems their plan worked perfectly, creating not one but three gigantic monsters. Davis learns all this from Dr. Kate Caldwell (Naomie Harris; Moonlight), the scientist who did the research on the formula. She teams up with Davis and government agent Harvey Russell (Jeffrey Dean Morgan; The Walking Dead) to get the antidote (well at least the "cure" for the overly aggressive behavior in the animals) from the Wyden's who are none too eager to part with it. In the end, everyone seems to get what they deserve and peace is restored... at least for now. I am always impressed with motion capture and the actors who portray various creatures and Liles does a terrific job of emoting through facial expressions. This really helps the audience connect with the ape. Johnson seems to improve over time and does some of his best work to date in this movie. He is far better than he was in San Andreas. Harris is solid and compliments Johnson well, as does Morgan. Akerman is deliciously evil as the villain here and plays her part well. I find nothing likable about her as it should be. The supporting cast rounds this ensemble well. Director Brad Peyton (San Andreas) does a nice job of balancing the first person perspective found in many video games these days with third person perspective. This, along with the script, helps to keep the audience engaged. 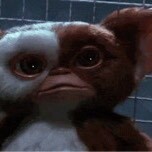 The special effects are excellent and very well done. Nothing looks cheesy or artificial, especially the monstrous creatures and nothing feels overdone or dragging. The action is well paced and seemingly necessary and garners appropriate audience reactions. 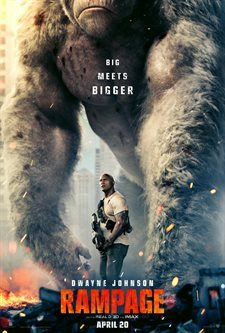 Rampage is a true popcorn action movie that offers the audience some great scenes and some emotional moments. The graphics are well done, the acting is solid and the script, while predictable, engages the audience with traditional dialogue and great comedic lines (and gestures). While the film may seem like your typical "guys blowing things up and destroying lots of buildings" kind of fare, it really has more to it and is a great date night movie. Time for this weeks screening. I still remember playing the video game in arcades when I was young. The Rock ... and a big gorilla!